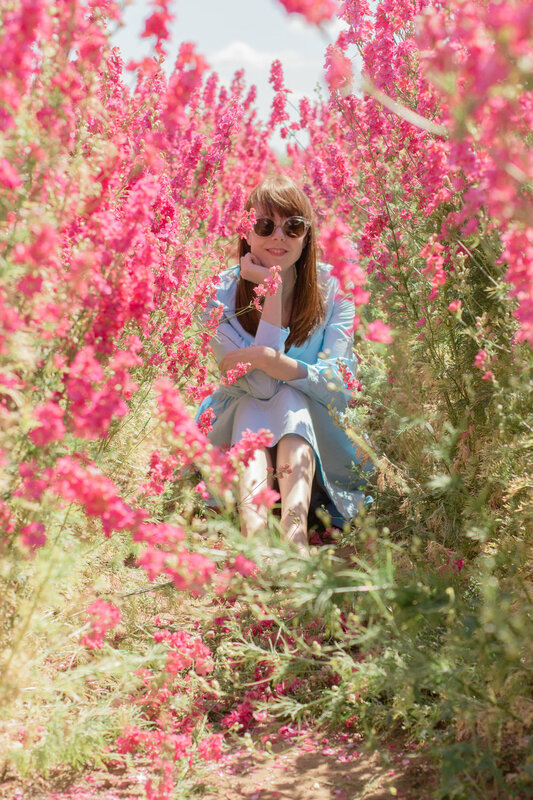 Ever since spying these flower confetti fields of flowers on Instagram two years ago, I've been itching to go. I may or may have not have even saved the date on my calendar a good year in advance, just to make sure I wouldn't forget. I knew it would be a popular place on a Saturday (and it sure was), so we made sure to arrive just when the fields opened. It meant catching a very early train, but it was more than worth it. 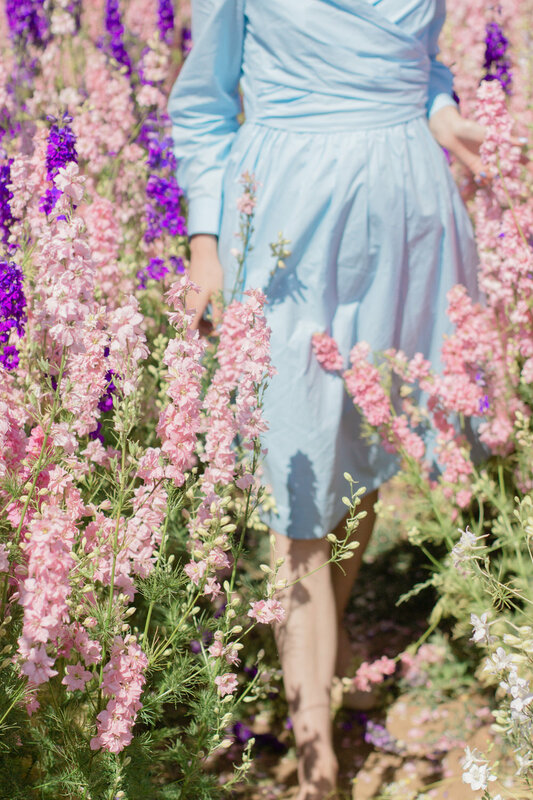 The fields are comprised of color blocked rows of delphinium blooms. These happen to be one of my favorite flowers—the tall blooms look striking in a vase, perfect for a dramatic centerpiece or entryway display. A couple of hours amongst these flowers had me smiling ear to ear. Being the flower obsessed person I am, it felt like I was finally in my natural habitat! 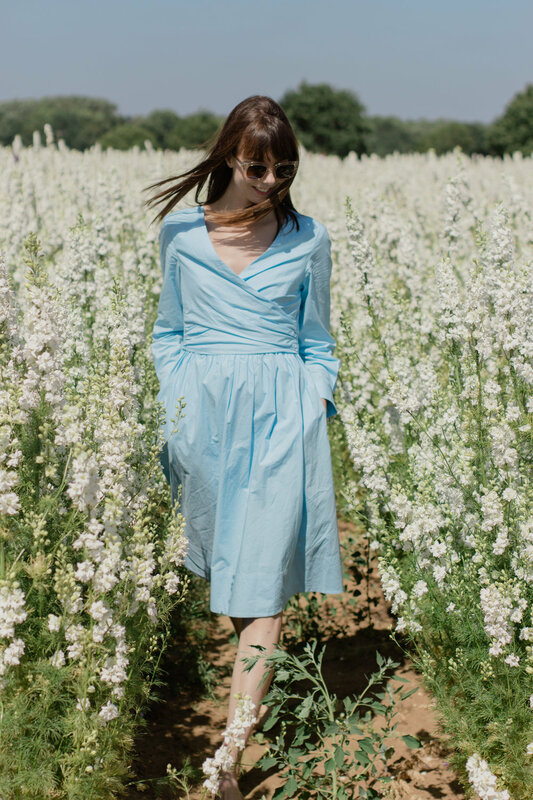 The simplicity of the dress, plus the timeless cut and color don't distract too much from the stunning blooms, but ensure that I still stand out amongst them for photos. 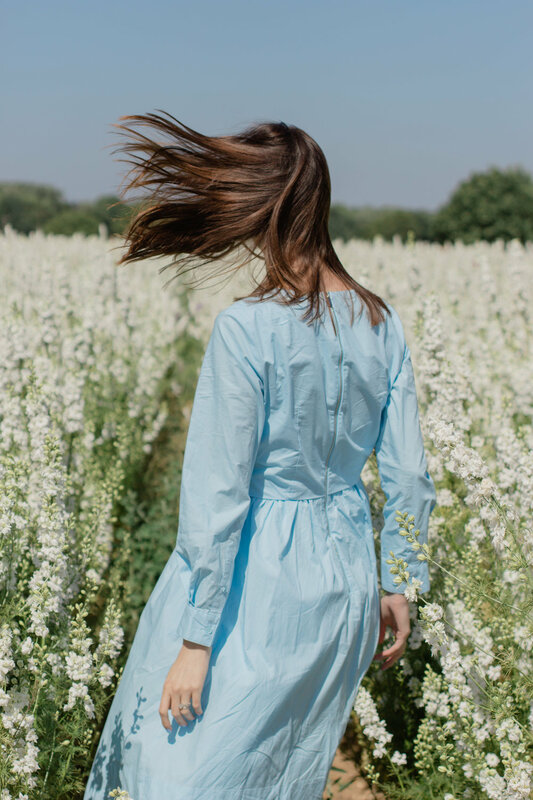 It was such a dream getting to walk (carefully) amongst the rows and rows of blooms. Up and down I went, moving from color to color, the smile rarely fading from my face. 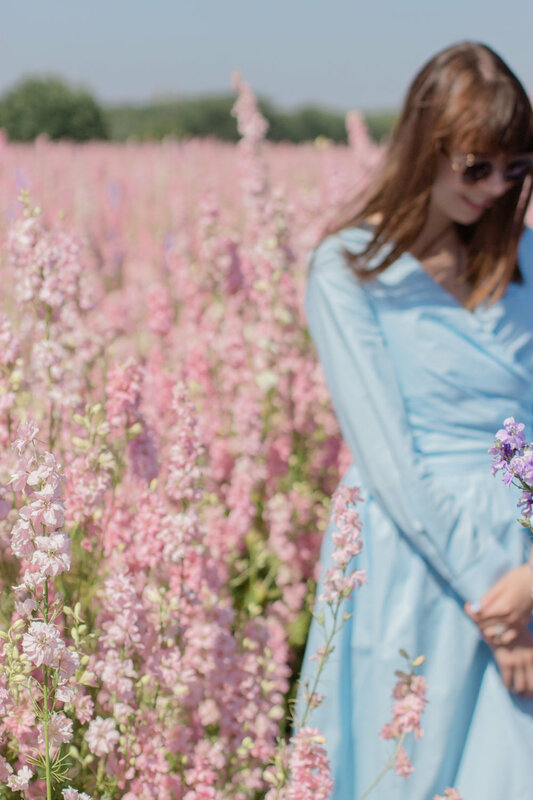 Each year for about a week, these fields of delphinium flowers open to the public. It's a place to marvel at the blooms, take photos (there's even a viewing platform) and purchase cut stems. 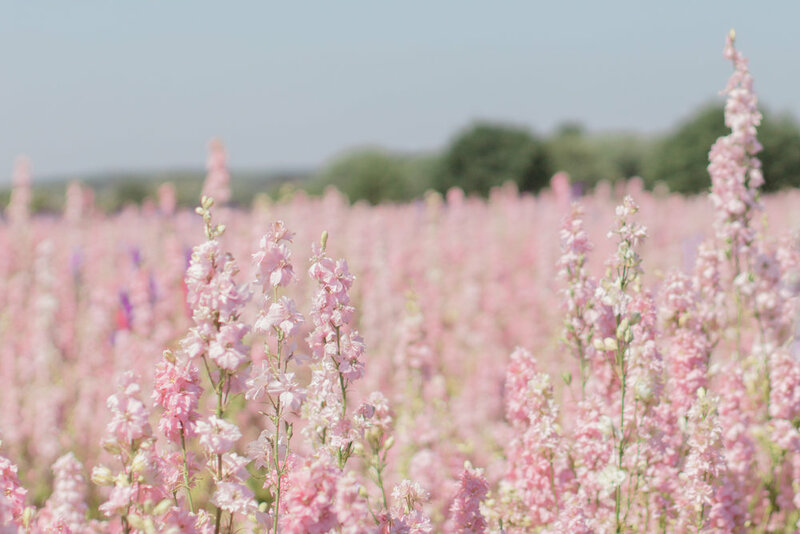 After the fields close, the blooms are harvested, dried and turned into eco-friendly confetti. 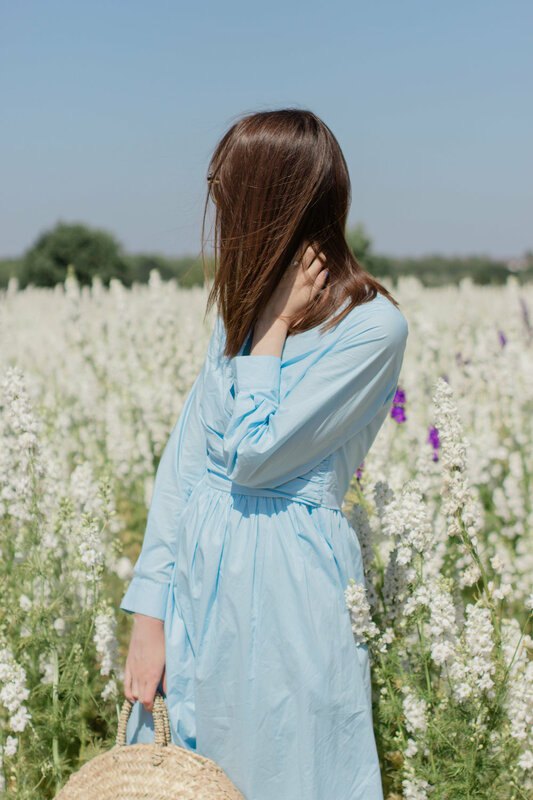 You might recognize the dress from this post. The white version is already one of my most worn items of clothing, so when I spotted the blue version on sale, I knew I needed to get it. And since I happened to have polish in the same color, I decided to match things up on my nails too. Why not? Another wonderful part of the day was happening upon a few other Instagrammers—a few of whom I've met before and a few I finally got to meet for the first time. Head over to Laura-Ann's blog to see a group video. I love how a beautiful spot can bring together so many people (and bring out so many smiles). It's always worth seeking out places, people and things that make you happy. How perfect when I can find all three in one field!